I have always loved corydalis, but none as much as this one! It's now on my 'Must Have' list!!! Thank you! What a beauty. I really have to try a little harder and get this one, My white C. solida just isn't as impressive! After poking around for more information, I remain confused. Is this a species found in the wild, or did it originate in a garden, and if so where? 'chinensis' is from China, 'warleyensis' is from Warley (Ellen Willmott's garden), but 'malkensis' is...? 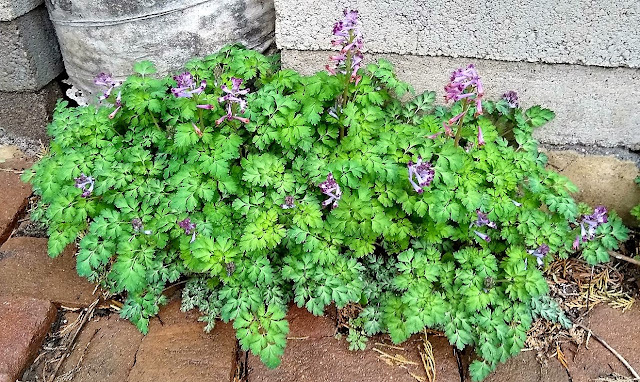 Corydalis malkensis is unquestionably a wild species endemic to the northern Caucasus (Kabardino-Balkaria province), named for the river Malka. It is a unique and distinct specie unlike any other. First called caucasica 'Alba'--which is similar but deep purple.